Travelling for work isn’t all fun and games. The plus point is we get to explore the town or city we’re in and discover new eateries along the way. A recent foray to Pontian, Johor saw us staying overnight in Johor Bahru (JB). Coincidentally, the owner of Crab Factory T.Y. Ooi was down south to oversee her new Crab Factory outlet...the rest is now food history. The restaurant set-up reminded me of the now defunct Crab Hut in Cyberjaya – it has the same functional interior with bare bone, industrial vibes and mellow lighting. It's ideal to rope in your gang of besties especially the crab-crazy ones if you like to dig into the seafood spoils. From the surfeit of specialities our gang gobbled up, I'd say go for the show-stealing Sotong Sumbat Coconut (RM33). 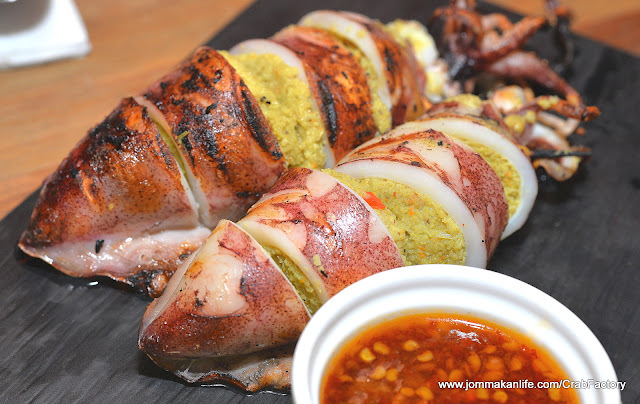 We just walloped the tender whole calamari with a delicious stuffing of turmeric, spices and grated coconut in a jiffy as the critters were sedap giler tahap dewa. Here's a quick PSA: Crab Factory’s signature Louisiana crab boil offerings now come in good value Crab Lover Giler sets featuring 2 NEW sauces: Cheese Sauce and Salted Egg Sauce (more on these later). 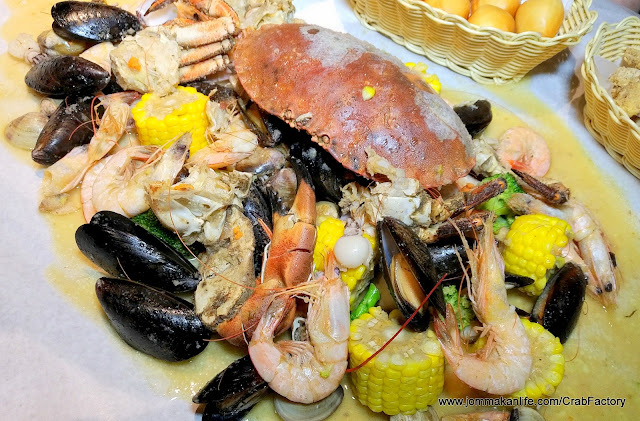 Cheers to Happy Seafood Meal Deals too like the Crab Lover Shiok at RM149.70 per set (good for 2-3 persons) consisting of Meat Crab XL (2 pieces), King White Prawns, Mussels, Squid, Hamaguri Clams, Corn, Brocolli, Fried Mantao and Shallot Rice. 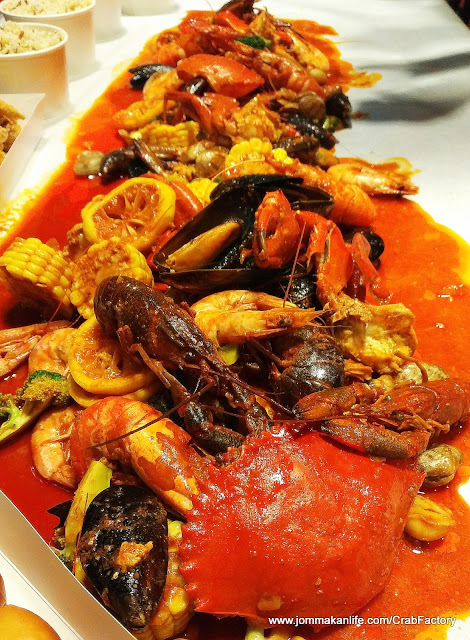 Our Gang Giler #1 set (RM539.10 per set, enough to feed 7-9 persons) in Garlic Butter Sauce had King White Prawns, Squid, Mussels, Hamaguri Clams, Corn & Broccoli. 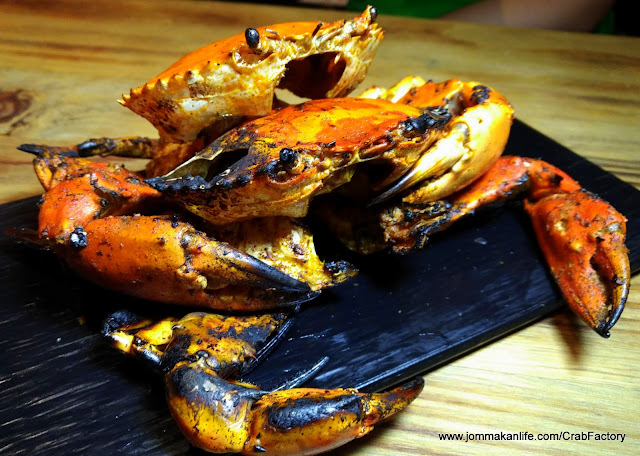 We also upgraded our set to include an imported Brown Crab (RM40 each). 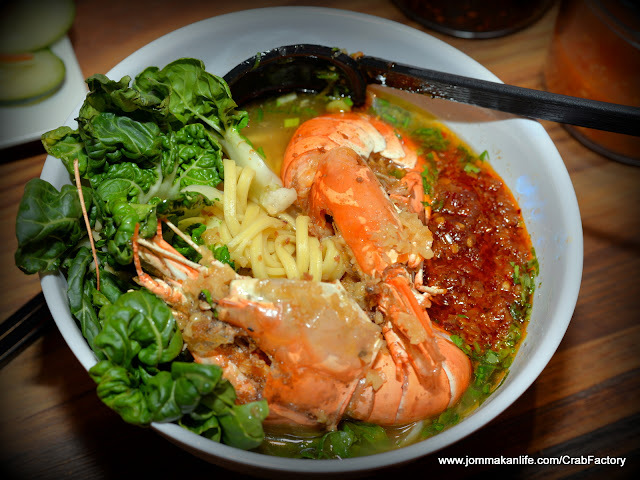 This seafood variety hit the spot for my friends who can’t stomach hot sauce - best for tastebuds hankering for the unadulterated sweetness of seafood. To please the opposing divide, our Gang Giler #2 set came in Medium Hot Southern Bang Sauce. We did justice to the 2 XL Meat Crabs, Mini Lobsters, Freshwater Prawns, Jumbo Sweet Prawns and Corn. We realised the riot of hot, salty and spicy flavours reached new level of sedap savouriness when Crab Factory’s newly introduced Cheese Sauce (add RM13.80) was thrown into the equation! 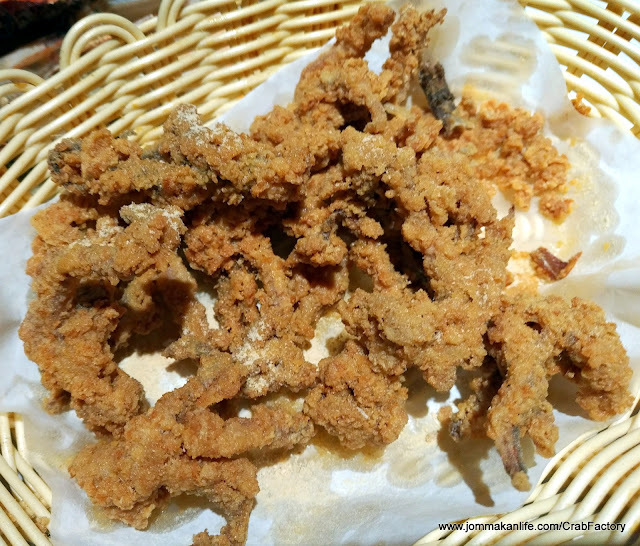 The kids in our midst were left to chomp on the accompanying serving of Fried Chicken Wings, a serving of Fried Mantao, a serving of Fried Squid Tentacles and 7-9 servings of Shallot Rice…food crazy people like us managed to wipe almost everything clean-lah. 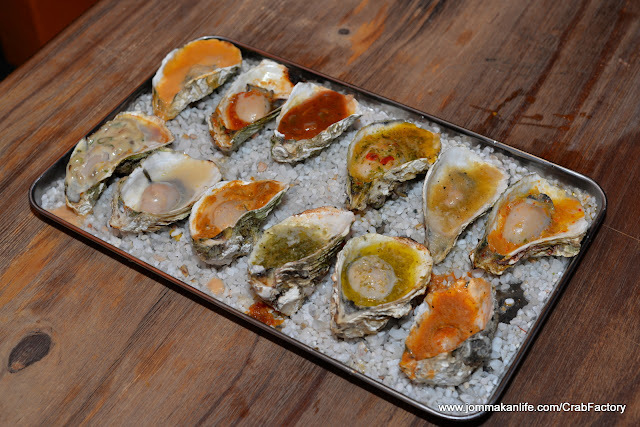 Somehow, our gang managed to put away 12 BBQ Oysters (RM69) too. Topped with 12 different saucy toppings, the succulent mollusks whetted our appetite before the mother lode of seafood arrived. 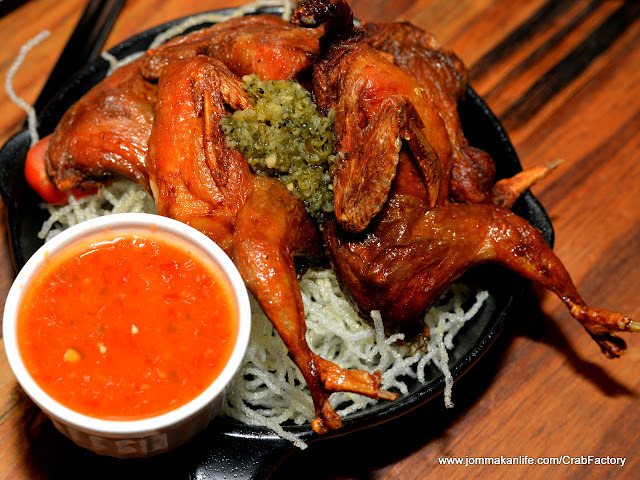 This speciality comes under the Bara BBQ menu available exclusively at Crab Factory JB. 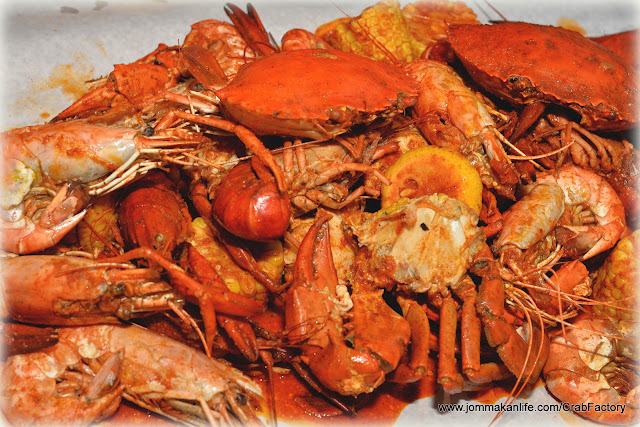 A choice of Cajun or Garlic Sauce is served with the BBQ Crabs here (RM39 per crab). 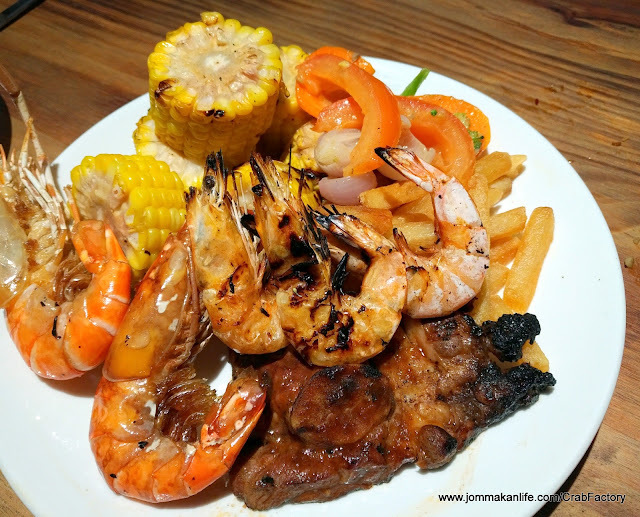 If you’re the surf & turf kinda diner, I recommend ordering the Best of Both Worlds (RM56.80) set featuring Signature Coke BBQ Lamb Chop, Fried Freshwater Prawns & BBQ King White Prawns with sautéed vegetable and French fries. The only time ‘yat kiok dap liong shuin’ – a Cantonese idiom for being a two-timing scoundrel is acceptable. 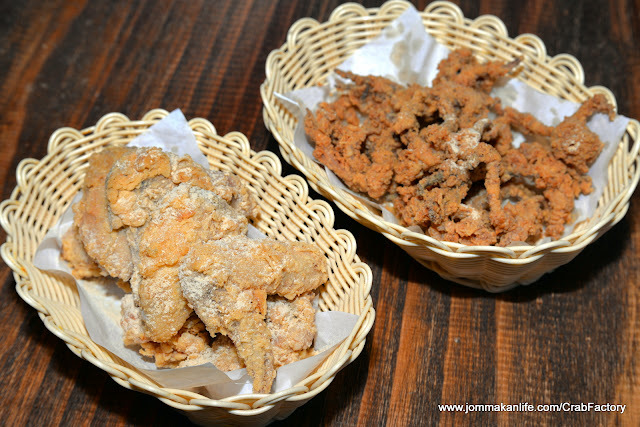 I also like the crowd-pleasing Fried Quails (RM22.80) and Corn Croquettes (RM11.80), both notable appetisers to nibble on to stave off hunger pangs and keep you from being too crabby should you need to wait. Har har. No time to feast on crabs for lunch? Fear not, CF has you covered too. 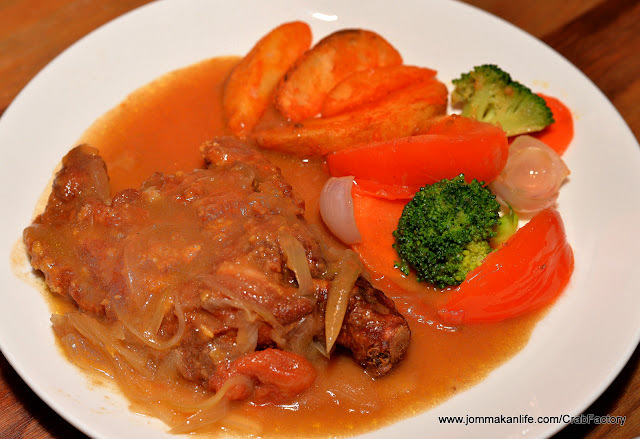 Order ajer the Lunch Special (up to 3pm) of Hainanese Fried Chicken Chop (RM15.50). Family and kid friendly to satisfy with Ice Lemon Tea & a scoop of Ice Cream on the house. Apa lagi you mahu? Oh, noodles and rice? 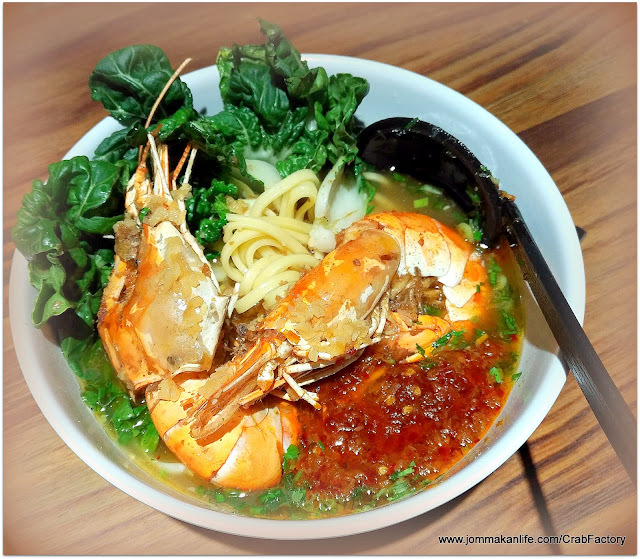 Sixth Bowl quickie selection offers Mix Balls (RM13.50) – soupy Fuzhou, Squid Ink & Fish Balls with Mi Xian (mee sua noodles) in Superior Soup and Freshwater Prawns (pic below, RM16.90 + 50 sen for spicy sauce) with Mi Lidi in Special Spicy Broth. The good folks at CF also invites customers to ‘Bowl-IT-Forward’: enjoy a Free bowl of Bouncy Balls for every 6 bowls purchased OR be a do gooder by donating it to Charity. Donated bowls will be channelled to selected children’s or old folks’ homes every 2 months when Crab Factory will visit and cook for them. 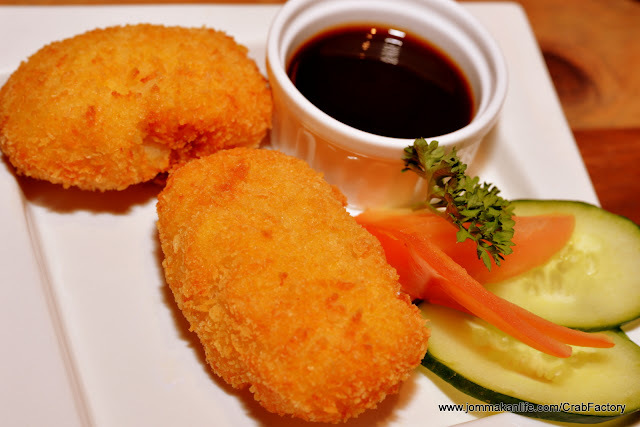 For reservations at CRAB FACTORY JB, call tel: 07- 351 4062. Address: Little Paris, Mount Austin, G14, Jalan Jaya Putra 1/1, Bandar Jaya Putra, Johor Bahru, Johor. Business Hours: Tuesday to Sunday, 12pm to 10pm. Closed on Monday.